There’s always some tidying up that can be done now, like the éclaircissage seen here at Chateau Margaux this week – the removal of excess bunches to prevent overcrowding; we’ll see more green harvesting as the veraison draws to a close, when it becomes easier to spot the bunches that are lagging behind. Meanwhile the trimming of leaves with a Japanese sword, as at Chateau Léoville Poyferré (below), isn’t something I’d practice at home. Concerns over la sécheresse or drought remain, especially for those growers with many younger vines on drier ground. 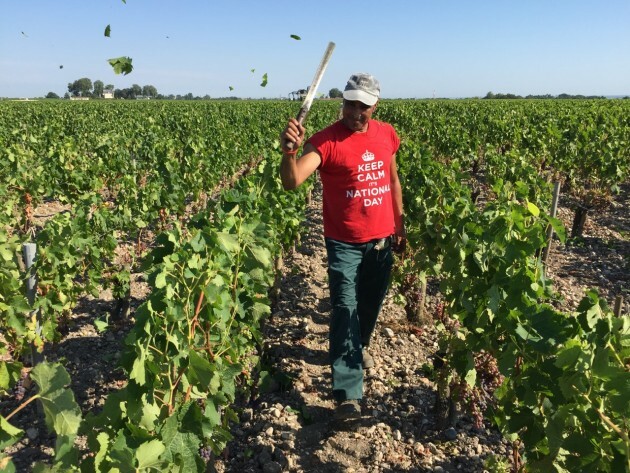 Irrigation, of course, is banned for all ’Appellations’ and if you go to different parts of Bordeaux right now, you’ll see that the ability of the vines to find moisture underground has a huge impact on the development of the grapes. In many parcels the mature vines are in rude health, such as those planted on the best gravel and clay mounds on the left bank of the Gironde, or on the clay-over-limestone on the better hills and plateaux around St-Emilion. Where the roots can’t find any water at all, the tiny berries are dried out and probably won’t recover, while the leaves down by the bunches are yellow and noticeably flagging. It’s also fascinating to see the different strategies that properties employ for looking after their vines. You don’t have to stray far off the D2 to see this, from Margaux north of the city up through St-Julien, Pauillac and St-Estephe. Some vines have had leaves stripped right back, the bunches fully exposed, and the crop has been thinned through fairly aggressive green harvesting. In contrast, it would seem that the estates that have taken a ’less is more’ approach have made the right call, given the heat and near-drought since mid-June, but you never really know until you taste the wine. 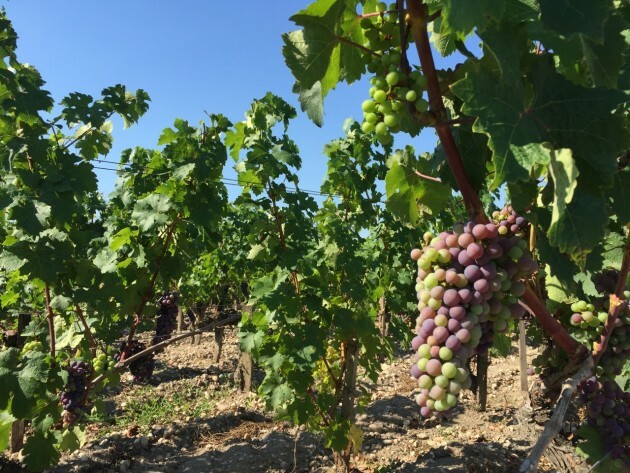 Talking of the heat and drought (see Bordeaux facing 40˚C), many areas of Bordeaux, such as Margaux, Léognan and St-Emilion have seen half the normal amount of rain during the growing season so far. I’ve put together the combined figures from eight sub-regions – the northern Médoc, Margaux, Léognan, Graves, Sauternes, Entre-Deux-Mers, St-Emilion and Blaye. It is worth noting that the autumn and winter of 2014-2015 was relatively dry, especially compared to the two previous vintages, so it’s not as if we started out with a surplus. The rainfall across those eight sub-regions from October 2014 to March 2015 averaged 417mm, against a 30 year average for Bordeaux of 534mm. The first fortnight of April was dry and sunny and the vines got off to a good start with budbreak then. The weather for the flowering in late May and early June was ideal and the rain soon after helped. There has been precious little rain since mid-June and the difference with July 2014 is enormous – 18mm vs 80mm last year. Both June and July in 2015 were 1˚C warmer than the 30 year average. It has been, at times, very hot – in the high thirties. Bordeaux is a huge area and there is always a significant variation in the weather between the regions. 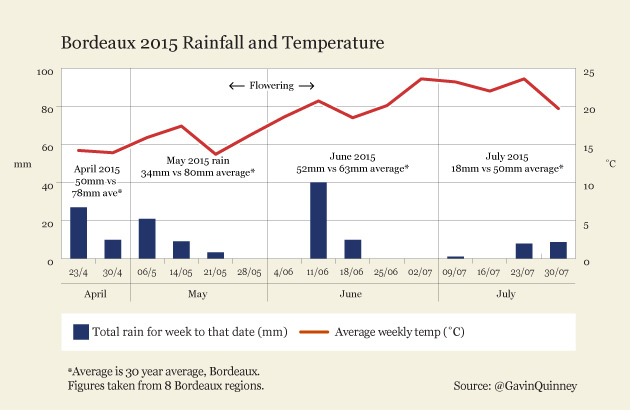 The 30 year average rainfall for Bordeaux for April, May, June and July is around 270mm. Margaux has seen 126mm, Léognan 138 and St-Emilion 138mm. I plan to pubish the graphs for these and other areas before the harvest. Many great vintages, such as 2005 and 2010, have been dry, warm years with a fine finish. We’ll just have to wait and see what the rest of the growing season brings.